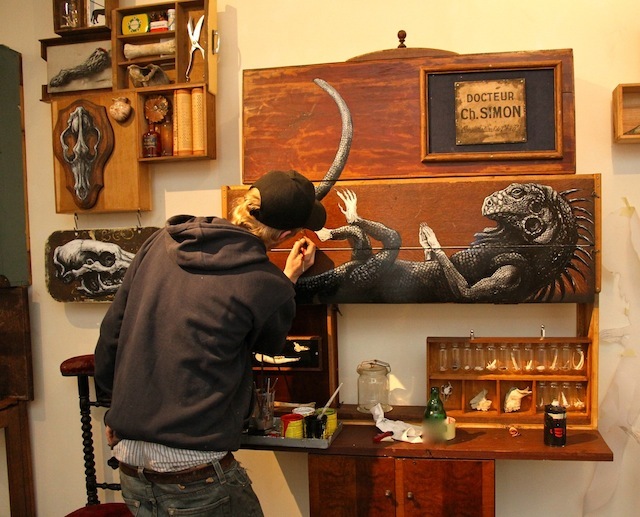 Here is a rare video of ROA and some of his latest ‘indoor’ work ​​on the occasion of ‘Stop Over’, his last solo exhibition launched a few months ago at Bodson-Emelinckx Gallery in Brussels. ” ROA approaches his gallery work in a completely different way than the work he does on walls in the wild. Like a caged animal, he appropriates the space and makes it his own. For this exhibition, the artist’s first solo gallery show in Belgium, ROA has transformed the whole gallery into a giant installation of curiosity cabinets.